One of the biggest surprises that I give people is when I tell them I played the violin all the time for about ten years. It's always a good one to stump people on when playing "Three Truths and a Lie". After going to college and since then I've kept it to playing once and a while, for fun. I don't remember the first time I can actually remember my great uncle playing his violin but I can remember when I first attempted it! 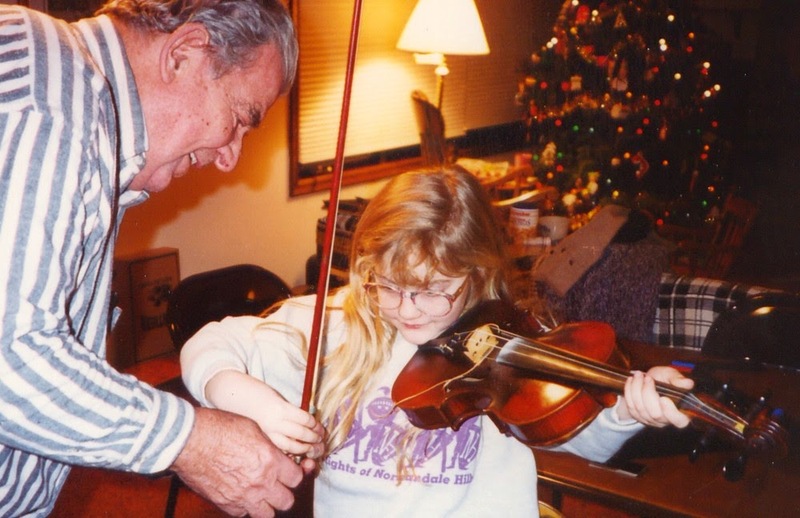 The photo above is my great Uncle Rich helping me to play his full size violin. Let's just say a small third grader who ended starting out with half size violin looked just a little bit silly with the full size one. After that night I wanted to play the violin so badly. My parents being the amazing parents that they were found me a teacher and started me up. They started me off with a teacher who taught the Suzuki method. Even now any time I hear any of the songs it brings back fond memories of recitals and playing for my parents every evening for my mandatory half hour practice. These two videos are two of my favorite songs from Book One and Two of the Suzuki method. Even now when I pick up my violin on occasion to play these two definitely make an appearance on the playlist. Even though I don't play as much anymore listening to violin music still is a soft spot for me and I'm still drawn to it. I used to dream about becoming an amazing player and doing amazing things like the dueling violins in Riverdance. Alas like many things of our childhood the violin is destined to remain a hobby of mine but I know I will definitely enjoy playing and listening to it for years and years to come.